The JBC Safety Plastic RS70032C-B3M64 Revolution Series 28" Traffic Cone Wide Body with 6" and 4" Reflective Cone Collars is made with premium grade PVC, which ensures durability, flexibility, and the ability to fully self correct into original shape after being crushed. 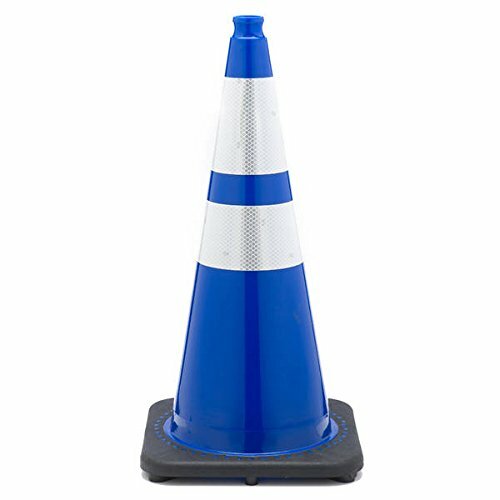 Blue traffic cone with black base. The patented interlocking base won't separate from the body even under extreme stress, such as being run over by a car. 3M reflective and prismatic material is high impact resistant and has a high nighttime reflectivity over a wide range of angles. If you have any questions about this product by JBC Safety Plastic, contact us by completing and submitting the form below. If you are looking for a specif part number, please include it with your message.